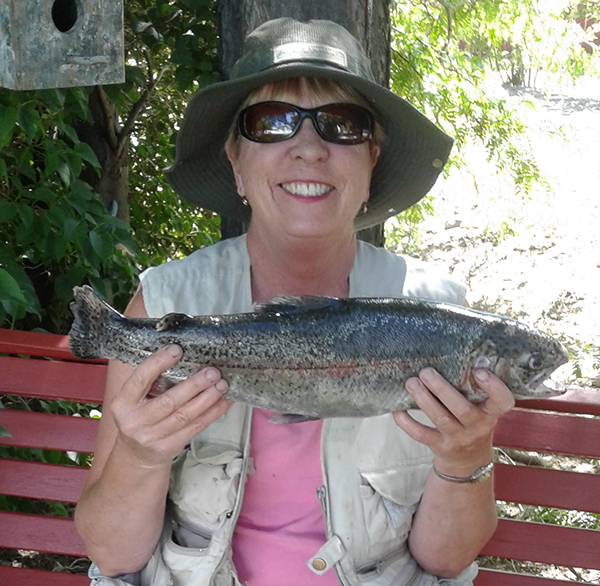 Pictured here is Peggy Bristol (Wellington, NV) with a four pound 17.5 inc Rainbow Trout caught on the West Carson River using a night crawler. Hello fellow anglers. Weather is questionable, but we have to expect changes this time of year. The higher lakes are starting to thaw and the Naw is up there right now, checking out the conditions. I only hope I don't encounter snow on my adventure. As a reminder, June 10th is free fishing day in Nevada. A licence is not required for any angler. But you must abide by any regulations regarding the water you choose to fish. The Nevada Department of Wildlife will be planting most of the urban ponds in our area. SILVER LAKE (Alpine County): The lake has thawed about 90 percent and a few boater's have been taking advantage of the early bite. Tom Blotter fished mid week and caught a couple mackinaw's in the 18" range. Tom also landed a nice 6 lb mackinaw using Rapala's. The ramp is open, but use caution this time of year. the lake level is down about 10 feet. CAPLES LAKE: The lake has open water around the Woods Creek area and along most edges of the lake. Good time to fish for big rainbows and browns. The resort is scheduled to open towards the end of June. The lake should ice out mid to late June. RED LAKE: The lake is thawing out and should be ice free very soon. There is open water around the edges for anglers to enjoy. Stay off of any ice left on the lake. WOODS LAKE: Is still closed. BLUE LAKES: The road is open to the third gate approx 4.5 miles in to faith Valley. Estimated to open fully early July. CARSON RIVER WEST FORK CALIFORNIA: The waters are high and the clarity is stained. Some anglers have had luck with salmon eggs in the slack water pools. When the sun is shinning, Panther Martin silver spinners have had success. Peggy Bristol; from Wellington caught a 4 lb rainbow using night crawlers. The rive have not been planted due to high water conditions.For more information stop by Todd's Bait and Tackle. CARSON RIVER EAST FORK CALIFORNIA: The river is running strong and fast. Not many anglers out this year due to the conditions. The river has not been planted due to water conditions. But the Alpine Chamber of Commerce will be loading up the rivers as soon as the conditions calm down. For more information, stop by the Carson River Resort. INDIAN CREEK RESERVOIR: The lake is high and starting to get a few weeds. The lake was planted last week by the Alpine Chamber of Commerce and the South Tahoe PUD. I would advise anglers that fish the inlet stream to practice proper angling. I witness many anglers snagging fish by the camp area and keeping them. If you accidentally snag a fish in the side or by the tail, you must release the fish unharmed. Only fish caught inside of the mouth are a legal catch. Salmon peach or rainbow power bait has been most productive. Fly anglers have been using olive buggers in the middle of the lake with good success. The campground and boat ramp is open. For more information stop by Todd's Bait and Tackle. TOPAZ LAKE: The water level is up, but beware of the floating debris coming in from the run off. Early morning has been more productive for anglers using blades and a night crawler. Asd the sun comes up you need to go deeper. Shore angler shave had fair success with power bait. With the cloud cover and cooler temps, this would be good weekend to fish the lake. JUNE LAKE: Boat and shore bait fishermen doing well with crawlers, power bait, mice tails, and pinched crawlers. A nice 4-5lb Cutthroat was taken from east shore this week. Trollers git'n bit with Taz Devils with pink/green patterns and a variety of Needlefish hauling in some nice rainbows and cutthroats. Start out early 25' or so increasing to about 50' mid-day. GULL LAKE: Bait and trolling methods working similar to June with multiple limits being caught. Try adding a marsh mellow or power bait to your crawler to float off bottom better. One visitor got a 5lb Rainbow first cast off back of his boat moored at Gull Lake Campground and not much after. That's the "first cast jinx". SILVER LAKE (Mono County): Lake is fuller than full decreasing shore access so boat, tube, kayak fishing is best bet for nice rainbows, Browns, and an occasional cutthroat. Try the inlet end up in the flooded areas. Logan at the marina suggests removing the head of a white/bubblegum mice tail and adding red power bait with the tail. GRANT LAKE: Lake is finally full and over spillway for first time in years. This results in excellent bait and lure fishing from boats, tubes, etc. in upper end near inlet. Trolling with similar methods as June catching some nice Rainbows and browns. Also try Rapalas with spin gear say 6-10' in evenings closer to shore or in shallower upper section. RUSH CREEK: Can't remember seeing more water in Rush than now. Creek is still fishable but use care and common sense out there. Bait offerings not working well due to high flows so throw Thomas Buoyants, Panther Martins, and Sierra Slammer jigs and swim baits. Nice 4lb Cutthroat was taken below Silver Lake recently. For you fly fishermen work all the lakes with tubes/small boats on top early and late going deeper to 25' with streamers and buggers as sun warms surface. Add a dropper to that streamer and stick to inlet areas when fishing Silver and Grant. For more up to the minute and detailed info check with the lake marinas and Ernies Tackle and Ski Shop at (760) 648-7756. They are convenitently located in June Lake Village. Good luck on your next fishing adventure. In the next report I will have a full detail of the Alpine County higher lakes and surrounding waters.